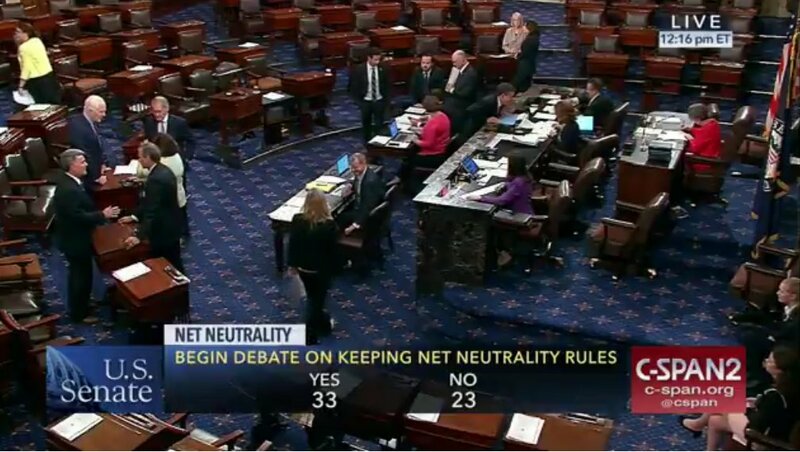 Today, Senate Democrats will force a vote on whether to rescue Net Neutrality from the depredations of Vichy nerd Ajit Pai; the debate is streaming now and will continue until 3PM Eastern/12PM Pacific, when the Senate will vote. Even if the Senate votes to overrule Pai's neutracidal FCC order, this is just the start of a long and improbably difficult road: we'll have to get Congress to vote to overrule Pai, too, and then Trump will have to agree. It's a weird year and anything can happen, but this is still a looooong shot. But what's an easy win is that this vote will get every Congressperson and Senator who's running for re-election in 2018 to publicly choose a side in the Net Neutrality debate. 87% of Americans want Net Neutrality; almost everyone who opposes Net Neutrality works for the telcoms industry or relies on them for campaign contributions. Campaign contributions are important: no one gets elected to Federal office without a lot of money; but it doesn't matter how much money you get if you don't get any votes. Net Neutrality is going to be an election issue in 2018, and everyone who votes against it today gives their opponents a giant spiky club to beat them with.